This wall mounted shower seat with arms is practical and thoughtfully designed. The legs can be adjusted to give the chair more or less height- whatever is most comfortable and easiest for the user. The arm rests can be folded up to enable transfer to the side. The seat clips on and off for easy cleaning, and the frame is made from epoxy coated aluminium for fewer rust problems even over a long period of use. 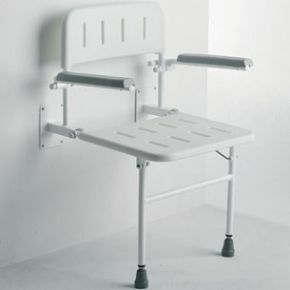 The plastic backrest and seat have drainage holes and offer both support and comfort in the shower, and when not in use the whole shower chair folds away neatly against the wall. Nice seat and water drains easily through the drainage holes. Just what I wanted , thank you Active Mobility.